The Governor’s Fiscal Year (FY) 2020 budget proposal provides modest increases in funding for public education, human services, and several other important investments. This new funding does not, in many cases, reverse deep cuts imposed across the state budget after the tax cuts of the late 1990s and early 2000s — despite a decade of expansion in the economy. Lost revenue from tax cuts has limited the Commonwealth’s ability to adequately fund education, infrastructure, and other building blocks of healthy communities and a strong economy. While the Governor’s proposal would increase year over year funding for several programs, it provides the same or less funding for programs such as Public Health, Local Aid, Juvenile Justice, Transitional Assistance, and others. The Governor’s proposal recommends 16 percent less funding for Early Education and Care compared to FY 2001 (adjusting for inflation). Funding for Local Aid is similarly down 38 percent and Environment and Recreation programs remain 29 percent below 2001 levels. Making the necessary investments in our schools, transportation, housing, and other essential programs will require bold, new revenue sources. Tax revenue growth was unusually strong in FY 2018 and may continue to be strong for most of FY 2019. The Department of Revenue expects that, without policy changes to increase revenue, overall revenue growth will slow markedly in FY 2020 — putting a strain on our capacity to support public programs and invest in infrastructure. While the Governor’s FY 2020 budget proposal includes a variety of new and expanded taxes and other revenues, a number of previously-scheduled tax cuts and other revenue-losing policy changes will take a significant bite out of revenue totals in FY 2020 and beyond. The Governor’s proposal is accompanied by a plan to overhaul Massachusetts’ school funding formula that could help ensure that all schools, especially those in low-income districts, are adequately funded. The plan makes some progress, over a seven-year timeline, to implement the 2015 Foundation Budget Review Commission (FBRC) recommendations related to health insurance, special education, and greater support for low-income and English Language Learner students. However, without substantial, new revenues the Commonwealth can only adopt a moderate plan to implement the FBRC recommendations. The budget proposal includes other notable initiatives. For instance, the Governor proposes creating a trust fund to prevent childhood lead exposure and increasing the “Real Estate Transfer Tax” to invest in climate change adaptation. Further, the Governor proposes new systems for negotiating the cost of drugs used under MassHealth and expands eligibility for low-income elders to qualify for the Medicare Savings Plan. Like MassBudget’s previous analyses, this report takes a deep dive in several areas across the budget. More so than in past years, we focus on key stories while inviting readers to use our Budget Browser to compare the Governor’s specific proposal with previous budgets going back to FY 2001. Readers can use the table of contents to jump to specific sections of this analysis. The Governor’s Fiscal Year (FY) 2020 budget proposes using a variety of new and expanded tax and other revenues, while a number of scheduled tax cuts and other revenue losses will take a significant bite out of revenue totals in FY 2020 and beyond. Tax revenue growth was unusually strong in FY 2018 and may continue to be strong for most of FY 2019. But the Department of Revenue expects that without policy changes to increase revenue, overall tax revenue growth will slow markedly in FY 2020, putting a strain on the budget’s capacity to support essential services. The Governor’s FY 2020 budget includes additional revenue from more than a dozen sources, both tax and non-tax (see table below). Some of the additional revenue will come from recently-enacted changes (such as taxes on recreational marijuana and on short-term rental accommodations like Airbnb); some from anticipated growth in non-tax sources (such as expanded casino resort gambling); and still other revenue is expected from initiatives newly proposed by the Governor, either in his FY 2020 budget or accompanying legislation. Together, these various additions would boost FY 2020 revenues by an estimated $860.2 million. Approximately $549.2 million of this total would come from ongoing revenues (available in FY 2020 and future years), while the remainder ($311.0 million) is temporary, one-time revenue and thus would not be available in future years. Offsetting most of the estimated gain from these additional revenues are anticipated revenue losses of $489.7 million due to scheduled changes in existing law. These scheduled cuts include reductions in the personal income tax rate, the planned sunsetting of the temporary supplemental Employer Medical Assistance Contribution, and an increase in the state’s Earned Income Tax Credit program (a successful income-boosting tax credit program for low- and moderate-income working households — see more discussion below). These changes will remove $489.7 million in ongoing revenues in the coming fiscal year (see table below). While these reductions already have been factored into budget writers’ revenue estimates (including the Governor’s) and thus do not create an unexpected hole in the FY 2020 budget, they nevertheless reduce the revenue available in the coming fiscal year and beyond. For more details about revenue proposals in the Governor’s FY 2020 budget, see the Revenue section of this analysis. Quality early education and care help prepare our young children for success in school and allows them to thrive. Early education and care also provide critical support for working parents with young children, by offering safe and reliable care for kids while parents provide for their families. The Governor’s Fiscal Year (FY) 2020 budget proposal allocates $656.8 million to early education and care. The proposal would generally continue early education programs and services at current levels, but would make no significant progress on expanding services for many low-income kids. The total amount of early education funding in the Governor’s proposal is a slight increase of $7.9 million (1.2 percent) above budgeted FY 2019 levels. There have been significant long-term cuts in early education and care since state tax cuts in the late 1990s and early 2000s. Funding for early education and care in the Governor’s FY 2020 budget is $121.2 million (15.6 percent) below what was available in FY 2001, adjusting for inflation (see chart below). For information on funding for all early education budget items going back to FY 2001, please see MassBudget’s Budget Browser here. The Governor’s FY 2020 budget provides $276.5 million for Income Eligible Child Care, $9.3 million (3.3 percent) below budgeted FY 2019 levels but in line with projected FY 2019 spending. Income Eligible Child Care provides subsidies for low- and moderate-income families not eligible for other child care assistance. With insufficient funding to meet child care needs across the state, the waitlist for these subsidies contained over 17,900 kids in January 2019. The state is unlikely to significantly reduce waitlists for income-eligible services given this proposed allocation for FY 2020. The Governor’s FY 2020 budget provides $276.0 million for Supportive and TANF Child Care, $36.5 million (15.2 percent) above budgeted FY 2019 levels. This increase should support services for more children. Supportive and TANF Child Care provides subsidies to children under the care of the Department of Children and Families and those receiving Transitional Aid to Families with Dependent Children (limited cash assistance along with work training programs for low-income families). The Governor’s FY 2020 proposal generally maintains FY 2019 increases in early education and care funding. However, the budget does not propose any additional funding dedicated to improving early education quality through further increases to the rates paid by the state to child care providers. In FY 2019, recognizing the importance of providing decent pay and reducing turnover at child care facilities, the budget provided $20.0 million in dedicated funding to support these rate increases. Providing an excellent education to all children in Massachusetts supports future generations while contributing to a strong, knowledge-driven economy. Chapter 70 education aid is the main program for delivering state support to local districts across Massachusetts and ensuring that schools have sufficient resources to serve all students. For further background on the state’s education funding system and the path forward to greater support for our students, see Demystifying the Chapter 70 Formula and Building an Education System That Works for Everyone. The Governor’s Fiscal Year (FY) 2020 budget proposal would increase Chapter 70 Aid and Reserves by $185.3 million (3.8 percent) to $5.11 billion. This matches the overall inflation rate required under the Chapter 70 law. It is also roughly the same as the 3.4 percent ($160.6 million) increase in FY 2019. All education grants outside of Chapter 70 that support local districts and other K-12 education programs would be increased to $786.8 million (up $84.6 million or 12 percent.) Much of this new spending is in two education trusts funded with a one-time shift in sales tax revenue (see the Revenue section of this budget analysis for further detail). The projected 12 percent increase includes all the funding deposited in these trusts. However, the projected total spending from these trusts in FY 2020 is unclear given currently available information (see discussion below). The Governor’s FY 2020 budget continues to take moderate steps to implement the recommendations of the 2015 Foundation Budget Review Commission (FBRC). The FBRC found that the Chapter 70 system and many schools across the state are significantly under-resourced relative to the Commonwealth’s estimate of the costs of educating children, called the “foundation budget.” This underfunding limits the capacity of schools across the state to help all children succeed, particularly those that educate a high proportion of disadvantaged students. Provide additional per pupil funding of $26 (0.2 to 1.7 percent more than the current budget after accounting for inflation) for the top half of districts with the largest concentration of low-income and ELL students. All other districts would have a standard inflation increase for low-income students. When fully phased in through FY 2026, this proposal would result in each district receiving a maximum of $4,800 per low-income student, up modestly from $4,000 in FY 2019. This change to low-income rates would be significantly less progressive than the $8,200 maximum proposed by the FBRC. Move the rate for out-of-district special education students towards a goal of three times the statewide per-pupil average, increasing this rate to $29,500 in FY 2020 (up 7.5 percent). Increase the allotments for employee benefits, including health insurance, closer to the goal of matching what the Group Insurance Commission pays for state employees. Overall, this increases health benefit rates by roughly 4.9 to 9.2 percent in FY 2020, depending on grade level, with further increases for disadvantaged kids (see bullets below). Expand the allotments for ELL students, with a particular emphasis on high school ELL students, who gain a rate increase of 87 percent (compared to roughly 16 percent increases for elementary and middle school ELL students). The Governor’s proposal differs from the original FBRC recommendation of consistent ELL rates across grade levels and is intended to provide greater support for teenage ELL students who may have particular challenges learning English. But the proposal excludes extra funding for roughly 6,000 students (according to the Department of Elementary and Secondary Education) formerly classified as ELL but who have reached a passing benchmark on the state language test (called ACCESS for ELL). Aside from the FBRC recommendations, the Governor’s FY 2020 Chapter 70 proposal creates a new enrollment category for teens in Early College and Innovative Pathways, which would be roughly $1,050 (11.0 percent greater) than that for regular high school students. Early college programs typically involve high schoolers who are simultaneously enrolled in college, earning credits towards a higher education degree, while finishing K-12 education. In a related move, the Governor proposes $3.0 million to the separate Early College Program line item, with a specific focus on science, technology, engineering, and math (STEM) coursework for disadvantaged students. Finally, $15 million over three years is allocated to early college programs from a new College Affordability and Success Trust Fund. The Governor’s proposal uses one-time revenue to create three other new education-related trust funds that would be available in FY 2020 and possibly several years thereafter. The first is the Public School Improvement Trust Fund, funded at up to $50.0 million, which would support initiatives to improve schools with low rankings on the state’s accountability framework. The second is the School Safety Trust Fund, funded at $30.0 million, which would support safety improvements such as enhancements to building infrastructure, communications, and staff training. The third (which is technically spending from a public health trust) is the Water Pollution Abatement, funded at $20.0 million, which would be used for de-leading projects in public schools. The funding amounts listed above are the maximum that could be spent for these purposes. It is unclear how much would actually be spent in FY 2020. The Governor’s FY 2020 budget provides $106.0 million to Charter School Reimbursements, $16.0 million (17.8 percent) above current FY 2019 levels. Historically, when fully funded, this program is intended to reimburse 100 percent of outgoing student funding from traditional districts to charter schools in the first year and 25 percent of this amount for each of the following five years. Under the Governor’s FY 2020 proposal and accompanying legislation, charter reimbursements would be more heavily weighted early on and only go for three years along a 100 percent, 60 percent, and 40 percent schedule. According to recent FY 2019 projections from the Department of Elementary and Secondary Education current funding levels only support 55 percent of the amount called for by the charter school reimbursement formula, leaving a $72.2 million gap. This underfunding means that only 80 percent of first-year outgoing student funding has been reimbursed by the state to districts in FY 2019, with no reimbursements available for students who left in any of the prior years. With additional aid, these gaps may be mitigated depending on how many additional charter school seats are added and how districts claim more reimbursements from the fund. For additional detail on charter school funding, recent proposals to alter the reimbursement system, and the impact of recent underfunding, see Charter School Funding Explained. The Governor’s FY 2020 budget proposes merging Extended Learning Time Grants into the Targeted Intervention in Underperforming Schools program and level funding the new combined program at $26.5 million. Additionally, the budget would provide the commissioner of the Department of Elementary and Secondary Education authority to use some of this funding to support a variety of initiatives, such as so called “empowerment zones” or “innovative partnership zones.” Typically, these arrangements have meant individual schools or neighborhoods would be taken out of traditional district governance under local school committees. Such zones are typically placed under the governance of alternative institutions, sometimes private non-profit education organizations or charter schools. The Governor’s FY 2020 proposal provides $970.0 million to the Massachusetts School Building Authority (MSBA) to support district construction and renovation projects across the state. This amount is $87.9 million (10.0 percent) above current FY 2019 levels. Higher education is an important factor in the success of our Commonwealth. Adequate state funding for higher education helps ensure that its benefits are broadly available to all who want to pursue a degree or credential beyond high school. Insufficient state funding, on the other hand, leaves students and their families facing higher tuition and debt, and threatens to put higher education—and the opportunities it offers—beyond the reach of those who cannot afford it. The Governor’s Fiscal Year (FY) 2020 budget increases funding for public higher education by 11.9 percent over FY 2019. However, the vast majority of this increase comes from a temporary $100 million trust fund, paid for by a “sales tax modernization” proposal. Excluding this one-time infusion, the increase over FY 2019 comes to 3.7 percent. Of that 3.7 percent, most covers increases negotiated with various campus unions via collective bargaining agreements. As detailed in MassBudget’s March 2018 report, Educated and Encumbered, state funding for public higher education in Massachusetts dropped 32.3 percent per student, adjusted for inflation, from FY 2001 through FY 2018 (the most recent year for which we have enrollment figures). These funding cuts followed a series of state tax cuts in the late 1990s and early 2000s. The results have been sharp increases in tuition and fees, which in turn have led to some of the fastest-rising student debt in the nation. The Governor’s FY 2020 budget remains well below FY 2001 levels and does not meaningfully reverse these trends, though as detailed below the budget does include substantial temporary funding for certain programs aimed at making college more affordable. For information on funding for all higher education budget items going back to FY 2001, please see MassBudget’s Budget Browser here. 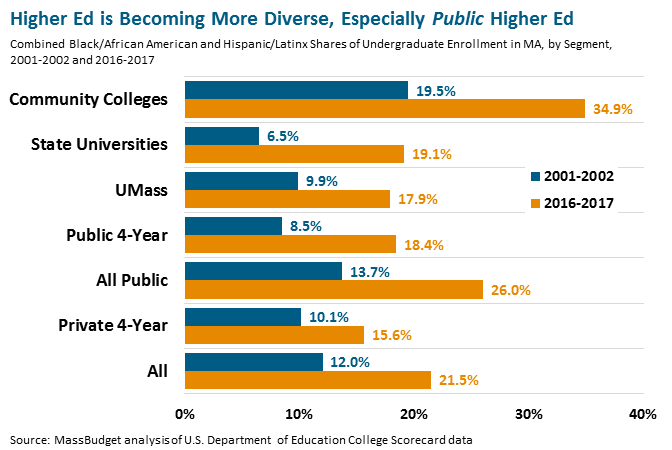 The effects of this reduced funding fall on a student body that is increasingly Black and Latinx, whose share of undergraduate enrollment at our state universities and University of Massachusetts has more than doubled from 8.5 percent in the 2001-2002 academic year to 18.4 percent in 2016-2017. At state universities, Black and Latinx enrollment shares nearly tripled, from 6.5 percent to 19.1 percent. Black and Latinx enrollment shares at community colleges have nearly doubled, from 19.5 percent to 34.9 percent. (See chart below.) These shifts, and parallel state funding cuts, raise important racial equity concerns. Instead of restoring the Commonwealth’s long-term commitments to higher education as a public good, the Governor’s FY 2020 budget proposes up to $100 million in one-time, off-budget higher education spending, paid for by “sales tax modernization.” (See the Revenue section of this budget analysis for more discussion of this sales tax modernization.) These additional funds will be “committed” in three phases starting in the fall semester of 2020. The final commitment phase will start in the fall semester of 2022. Each phase will fund students for up to six years, so the fund should be completely spent by the end of the 2027-2028 academic year. 25 percent for the Commonwealth Commitment program, which allows students to save money on bachelor’s degrees by enrolling first in a community college and then transferring to a state university or UMass campus. The administration hopes to fund 4,000 Commonwealth Commitment enrollees by 2024 from the CAST. Since Commonwealth Commitment began in 2017, 363 students have participated, according to the Executive Office of Education (EOE). The program requires students to enroll full-time and maintain a 3.0 grade point average (GPA). In Massachusetts, college students at public institutions work about 28 hours per week, on average. Among those working students, most work more than 20 hours a week. Research has shown that when students work too much, it can hurt their GPAs and can significantly hinder degree completion. The CAST’s substantial (albeit temporary) additional funding for the Commonwealth Commitment could help thousands of students better afford a bachelor’s degree, but it will be important to help them meet the program’s rigorous standards — especially low-income students who need to work to make ends meet while enrolled. 15 percent for early college programs, wherein high-school students take college-level courses and pursue work experience, with the aim of being better prepared them for postsecondary and career success. According to EOE, about 1,000 students were enrolled in the first early college cohort as of October 2018. The allocation from CAST could be enough to fund another 6,800 participants. For more on early college, see the K-12 Education section of this budget analysis. 25 percent for scholarships to students participating in “college success” programs at public and private four-year institutions. 25 percent in matching grants for paid internships and co-ops for students enrolled in public colleges and universities. At an average cost of $4,500 per semester-long placement (assuming students work 20 hours per week, at $15 per hour, for a 15-week semester), this funding could support over 5,500 semester-long internships or co-ops. 10 percent for “pilot programs that demonstrate innovative financial aid strategies,” including income-share agreements, efforts targeting disconnected youth and adult learners, and competency-based education. The Governor calls for funding from the CAST to prioritize public colleges and universities that “develop long-term plans for reducing student charges and ensuring financial sustainability.” Institutions, however, may find it challenging to make such long-term plans on the basis of temporary funding while the overall higher education budget remains so far below FY 2001 levels. The Commonwealth subsidizes health insurance for about 1.8 million people, including about half of the state’s children. In addition, the state budget funds payments to health providers — such as hospitals that serve large numbers of low-income patients and nursing homes — to help pay for care provided to low-income patients. The MassHealth program is funded by a combination of state and federal revenues. Although there is some variation, overall, the federal government reimburses the state for more than 50 percent of spending on MassHealth. For this reason, the gross spending on the program (as presented in the budget) is significantly more than the actual “net” cost to the state, taking into account the federal reimbursement. For information on funding for all MassHealth (Medicaid) and Health Reform budget items going back to Fiscal Year (FY) 2001, please see MassBudget’s Budget Browser here. The Governor’s FY 2020 budget includes two major health reform initiatives. In order to address the state’s increasing spending on prescription drugs within MassHealth, the Governor proposes new systems for negotiating and monitoring the costs of these drugs. The Governor also expands eligibility for the Medicare Savings Plan for low-income elders. The Governor’s budget language proposes a four-step process to curb the high cost of prescription drugs. The first step would authorize MassHealth to directly negotiate with drug manufacturers for supplemental rebates and what the Governor refers to as “cost-effective outcomes-based contracts.” If that step were to be insufficient, MassHealth could then set target values for high-cost drugs through a public process, and MassHealth would seek a rebate based on that determined value. If neither of those steps were sufficient, MassHealth could refer specific, high-cost drug manufacturers to the Health Policy Commission. The Health Policy Commission could require the manufacturers to submit cost disclosures and to testify at public hearings to justify their drug prices. This option would be for manufacturers whose drugs cost at least $25,000 per person per year or $10 million in total annually. Finally, the Governor proposes that if the Health Policy Commission determines a manufacturer’s price for a particular drug is too high, the Attorney General could be brought in to determine whether the manufacturer might be violating consumer protection laws. This proposal is anticipated to save $70 million ($28 million in savings net of reduced federal reimbursement). In materials accompanying the budget, the Governor noted that MassHealth will also put in place requirements making the pricing of pharmacy benefits in Managed Care and Accountable Care Organizations more transparent. This reform should save $10 million ($4 million net) in FY 2020. Unlike in his FY 2019 budget proposal, the Governor has not included any restrictions to the MassHealth drug formulary for FY 2020, but the Governor estimates these pharmacy reforms will save the state $80 million in FY 2020. The other major initiative in the Governor’s health care budget is a significant expansion of the Medicare Savings Plan, which would benefit about 40,000 low-income elders in Massachusetts. The Governor is proposing expanding eligibility for elders in two ways: increasing the program’s income threshold by 30 percentage points (bringing the eligibility threshold up to 165 percent of the federal poverty level) and doubling the eligibility asset limit. The Medicare Savings Plan encompasses three separate federal programs (with tiered eligibility and benefits). In Massachusetts, these programs operate through the MassHealth Buy-In program and MassHealth Senior Buy-In program. Massachusetts is reimbursed 50 percent by the federal Medicaid program for the MassHealth portions of these programs. The federal government, however, fully funds the Medicare portions of these programs. Moreover, Massachusetts has a separate state-funded program (Prescription Advantage) that helps low-income elders with prescription drug costs that are not covered by MassHealth or the Medicare subsidies. Because the federal government pays for Medicare Part D drug subsidies, the Governor notes that expanding eligibility for the Medicare Savings Plan will bring in federal dollars to cover costs previously covered by the state, and will also significantly expand the number of elders eligible for prescription drug subsidies. Raising the income threshold and increasing the asset limit for the Medicare Savings Plan means that approximately 15,000 elders currently enrolled will be eligible to move to one of the programs with more generous benefits, and as many as 25,000 more elders will become newly eligible. The Governor estimates that the cost to the state of expanding eligibility for the program would be approximately $30 million, which would amount to about $4 million after accounting for federal reimbursement. The budget anticipates a 10.9 percent reduction in funding for the Prescription Advantage program as more elders become eligible for the more generous Medicare Savings Plan. There is also language in the budget that would allow the Administration to transfer funding from Prescription Advantage and from the Health Safety Net to cover the expansion of the Medicare Savings Plan if needed. The Governor also estimates this program change would bring in about $100 million more federal Medicare dollars into the state’s economy. The Governor’s total funding for the MassHealth program is $16.54 billion, $180.0 million more than the current FY 2019 budget total and slightly above FY 2019 estimated spending, but only after accounting for some “cash management” strategies to shift some costs (see below). After accounting for federal reimbursement, the net cost of the Governor’s total is $6.59 billion. The MassHealth budget’s low growth rate compared to FY 2019 is partly due to a quirk associated with an accounting “leap year” in that there will be 53 weeks’ worth of MassHealth claims in FY 2020. The Governor is choosing to pre-pay (move) this extra week of MassHealth expenses from FY 2020 to FY 2019, adding $116 million to the FY 2019 estimated spending total. The Administration is also planning on pre-paying an additional $107 million in other claims in the MassHealth Fee-for-Service program. These cash management strategies increase FY2019 spending totals by $222 million ($100 million net of federal reimbursement) and decrease the FY 2020 MassHealth budget by the same amount. One area where MassHealth will continue to expand services is in combatting substance misuse to address the opioid epidemic. The Governor notes that the MassHealth budget include $49.4 million to expand treatment services for people struggling with addiction, particularly individuals with co-occurring mental health disorders. This is more than double the amount spent in FY 2019, and is part of an ongoing effort to expand these services. The Governor also states that these dollars will help expand residential rehabilitation and better coordinate recovery services. ConnectorCare, the publicly-subsidized, commercial health insurance available for eligible, lower-income Massachusetts residents through the Mass. Health Connector, is funded through the Commonwealth Care Trust. The budget includes a transfer of $123.6 million to this trust from tobacco excise revenue (see table). One of the other funding sources for ConnectorCare is what is known as the Employer Medical Assistance Contribution, or EMAC. Most employers that contribute to unemployment insurance must pay this contribution to support health insurance that is provided by the Connector, including health coverage for people receiving unemployment insurance. Starting in 2017, the Legislature added a temporary (two-year) supplemental assessment to the EMAC on employers with employees covered under either MassHealth or receiving subsidized commercial coverage through ConnectorCare. The temporary EMAC will bring in about $231.4 million in FY 2019, but only $70.3 million in FY 2020, as the assessment sunsets on December 31, 2019. In his FY 2020 budget proposal, the Governor creates two trust funds — totaling $22.7 million — to launch efforts to prevent lead exposure among children who are at highest risk. Preventing lead poisoning among children features prominently in the public health portion of the Governor’s Fiscal Year (FY) 2020 budget proposal. Lead poisoning a serious hazard and low-income children in poorly resourced communities are at highest risk. Some of these lead prevention efforts would fall under the Department of Public Health (DPH), which protects the health and well-being of people in Massachusetts. These include prevention and treatment services, improving health care access, and ensuring the safety of food and water in the Commonwealth. For information on funding for all public health budget items going back to FY 2001, please see MassBudget’s Budget Browser here. The Childhood Lead Poisoning Prevention Trust Fund includes $2.7 million for training lead paint inspectors and homeowners on how to prevent or treat lead exposure from paint. Although lead poisoning rates dropped significantly from 1997 to 2015, the majority of housing units in Massachusetts still have paint containing lead. And, low-income families who have limited housing options and those living in old housing are at higher risk of lead poisoning. Swallowing lead particles from paint chips or breathing in air with lead particles can cause brain damage, learning disabilities, and behavioral problems. Communities with particularly high rates of childhood lead poisoning — from about seven to 14 cases per 1,000 — include Brockton, Springfield, North Adams, Southbridge, and Ware. The Governor also dedicates $20 million to removing lead from water used in public schools through the Water Pollution Abatement Revolving Fund. In other areas of public health, the Governor proposes some increases, such as $850,000 more for a Healthy Relationships Grant Program to prevent domestic violence and sexual assault, particularly in “high-risk communities.” This builds on the $150,000 for this program in FY 2019 and will support the work of community-based or school-based organizations. A $765,000 (60 percent) decrease for Community Health Center Services. A $4.5 million (90 percent) decrease for a Youth-At-Risk Matching Grants program (which helps support youth organizations like YMCAs and Boys and Girls Clubs). Some of these funding amounts are similar to what the Governor proposed last year for FY 2019, but the Legislature subsequently proposed increases to these programs to get closer to meeting projected needs. Outside of the budget, the Governor includes $10.8 million in the Public Health Trust Fund, which was created for social service and public health programs dedicated to gambling prevention, substance abuse services, and other services related to compulsive gambling. This funding is $7.8 million more than current budget levels and comes from fees on casinos and other gaming establishments. More information can be found in the Non-tax Revenues section of this analysis. The state’s housing budget funds programs that help people earning low incomes afford housing and provides shelter to families and individuals, including youth, who are homeless or at risk of homelessness. Because of high costs, particularly in Greater Boston, housing claims a large portion of incomes earned by both renters and homeowners. According to the 2017 Greater Boston Housing Report Card more than half of renters and one third of homeowners are cost-burdened, meaning they pay more than 30 percent of their incomes in rent or mortgage, respectively. The Governor’s budget proposal for Fiscal Year (FY) 2020 provides $490.2 million for affordable housing and homelessness assistance programs across the budget, $5.1 million above the amount the state expects to spend in FY 2019. For information on funding for all housing budget items going back to FY 2001, please see MassBudget’s Budget Browser here. The Governor proposes about the same level of funding for affordable housing programs in FY 2020 as the state provided in FY 2019 with one exception. His budget recommends $5.3 million for the Housing Choice program, which receives funding from a variety of sources to provide incentives to cities and towns to increase and diversify their housing stock. The Governor included this program in his budget proposal last year, but it was not included in the final budget for FY 2019. The Governor’s budget recommends level funding the state’s two largest affordable housing programs: subsidies for local housing authorities, which provides support for local housing authorities, and the Massachusetts Rental Voucher Program (MRVP), which helps low-income people pay rent. In past years the state has increased funding for MRVP in part to help reduce the number of low-income families who become homeless and require shelter. Without an increase in MRVP in FY 2020, the state may not be able to create additional vouchers. A large share of the state’s housing budget provides shelter and assistance to families, adults and youth who are homeless or at risk of becoming homeless. The Governor’s proposal essentially level funds the Emergency Assistance (EA) program at $178.0 million which is only slightly above the amount the state expects to spend in FY 2019. The Administration estimates the FY 2020 budget will fund EA for the full fiscal year. Because EA serves all low-income families who are homeless and qualify for shelter, if the state runs out of funding the Legislature must provide supplemental funding. In the last several years the state has reduced funding for EA as it tries to move more families into housing using programs like MRVP. However, as noted above, because the Governor’s budget does not propose additional funds for this voucher program in FY 2020 the state may not be able to create additional vouchers to help families move out of EA shelters and into permanent housing. Human services include an array of programs to promote the well-being of children, seniors, veterans, people with disabilities, and others across Massachusetts. The Governor’s budget proposal for Fiscal Year (FY) 2020 would fund these supports at over $4.78 billion. For information on funding for all individual human services budget items going back to FY 2001, see MassBudget’s Budget Browser here. In the Governor’s FY 2020 budget proposal, there are several reforms to the Transitional Aid to Families with Dependent Children (TAFDC) program which provides cash assistance to families with little to no income. With these proposed reforms, the Governor takes steps to help more families access needed benefits, but also includes provisions that could make it more difficult for others. First, the proposal lifts the restriction that prevents families from claiming the benefit for children conceived or born after a family has begun receiving aid, also described as the “cap on kids.” This would enable over 9,000 children in low-income families to now be included in the calculation of their families’ TAFDC benefits. Previously, the Governor had opposed lifting the cap in the Legislature’s FY 2019 budget, at the time saying that removing the restriction “without other accompanying changes could have the perverse effect of reducing incentives for TAFDC recipients to get back to work, and cause existing inequities in the TAFDC program to persist and expand.” To address this, the Governor amended the language to include counting adult Supplemental Security Income (SSI) in determining eligibility and benefit amount, including all members of the household who receive SSI in each TAFDC case. This new criterion could result in a reduction of benefits for almost 7,000 children, based on an FY 2018 estimate. The Legislature rejected the amendment during the FY 2019 budget debate, and the Governor then vetoed lifting the cap. The Governor’s FY 2020 budget proposal re-introduces similar language as part of the larger set of TAFDC reforms. Additionally, the budget proposes that the value of a single car would not be counted among assets in determining a family’s TAFDC eligibility. This would protect or improve TAFDC recipients’ access to transportation without affecting their qualification for the benefit. The proposal also removes a grant deduction for homeless families so that families would not have their benefit value reduced due to the cost of temporary shelter. The Governor proposes $15.0 million for the Department of Children and Families’ Family Resource Centers, which is essentially level with appropriations from the previous year. This amount is higher than estimated spending for FY 2019, which is $12.3 million. These centers provide community-based services, resources, and support to families, including assistance during crises. Of this funding, $2.7 million would be used for the expansion of five existing centers and the development of two new ones. For elder services, the Governor proposes a 33.6 percent increase in funding for the Elder Nutrition Program, which would bring it to an all-time high of $9.7 million. This increase seeks to maintain nutritional quality and meet higher projected need for the program, which provides healthy meals, screenings, education, and counseling for over 9 million seniors each year. Notable among the Governor’s FY 2020 proposals in disability services is $6.9 million in funding for Autism Omnibus Services, a 38.0 percent increase that follows a similarly large increase of 35.6 percent in FY 2019. These services expand the scope and quantity of supports available to youth under 21 with autism spectrum disorders. The proposed increases reflect higher projections of need for these services since the program was established 2014. The Governor also proposes keeping funding for the Office for Refugees and Immigrants’ Low-Income Citizenship Program essentially flat from FY 2019. This program provides assistance to legal permanent residents in becoming citizens, with priority given to those with low incomes. "Local aid" refers to money that flows from the state budget to city and town budgets, helping municipalities fund local services such as police and fire protection, parks, and public works. Some local aid has few restrictions on its use, while other aid goes to some cities and towns for specific purposes. Local aid for education is discussed in the Education section of this report. For information on funding for all Local Aid budget items going back to FY 2001, please see MassBudget’s Budget Browser here. Massachusetts is made up of 351 separate city and town governments whose levels of wealth range widely. Yet each of them is charged with providing similar levels of vital public services. State government in Massachusetts uses general local aid as a mechanism to help offset inequality of local services that would otherwise exist if these cities and towns primarily funded their budgets with local property tax revenue. The Governor proposes to provide cities and towns with $1.13 billion in Unrestricted General Government Aid in Fiscal Year (FY) 2020. This would be an increase of $29.7 million over the FY 2019 amount, or 2.7 percent. It would be the smallest annual increase of any year since Governor Baker took office. Last year’s budget provided a 3.5 percent increase over FY 2018. The Commonwealth’s capacity to fund general local aid has been hindered by a series of significant state-level tax cuts during the 1990's and 2000's. While over the past several years, general local aid funding has increased in step with or slightly above inflation, it still remains 40.0 percent below FY 2001 levels, when adjusted for inflation. For more information on general local aid, please see Demystifying General Local Aid in Massachusetts. The Commonwealth provides other sources of local aid to cities and towns for more specific purposes. The largest form of local aid is for K-12 education, which is discussed separately in the K-12 Education section of this budget analysis. $10.8 million for the Municipal Regionalization and Efficiencies Incentive Reserve, which is targeted to several local grant programs and incentives to promote municipal best practices. The amount is $135,000 below the current FY 2019 budget. $28.5 million for local payments in lieu of taxes to communities with state-owned land that is not subject to local property taxes. This is the same amount as in the current FY 2019 budget. $721,000 to share state horse racing revenue with cities and towns, the same amount as in FY 2019. There are other proposals in the Governor’s budget that would increase resources available for municipal governments for some activities and decrease it in others. Some revenues from the Governor’s proposed increase to the real estate transfer tax would provide off-budget support to help cities and towns make their infrastructure more resilient to climate change (see the Revenue section of this report). Meanwhile, the Governor proposes to redirect a portion of gaming revenue from the Transportation Infrastructure and Development Fund, of which half is required to supplement funding for municipal transportation, to the Commonwealth Transportation Fund without any specific designation for local uses. The state supports an array of transportation systems, including roads, bridges, rail, buses, airports, and ferries that enable people and goods to travel where they need to go. Much state funding for transportation takes place through dedicated revenue sources and a separate capital budget process. For information on funding for all transportation budget items going back to Fiscal Year (FY) 2001, please see MassBudget’s Budget Browser here. Decreasing support for RTAs to $86.0 million, a reduction of $2.0 million from FY 2019 levels. Of this total, $4.0 million would be directed to the Massachusetts Department of Transportation (MassDOT) to eventually transfer to individual RTAs contingent upon MassDOT’s determination that each RTA follows certain practices that will be laid out in a memorandum of understanding with each authority. The FY 2019 budget set aside the same $4.0 million amount to be distributed to RTAs, conditioned upon their agreement to adhere to best practices, though these funds have not yet been made available to the RTAs. For FY 2020, the Governor’s budget proposes that MassDOT would establish performance metrics, including explicitly a target for the ratio of revenue obtained through passenger fares. The policy, if implemented, could encourage RTAs to increase fares in the future to ensure they receive these conditional funds. The same $127.0 million amount for MBTA operating assistance as the prior two years. This funding would be $60.0 million below the $187.0 million provided in FY 2016 and FY 2017 as a result of a shifting of funds from operations to capital investment. As with the previous two years, the MBTA board has taken the position that $127.0 million in state operating support will be sufficient for FY 2020, opting for the $60.0 million to instead be used in a supplemental capital funding account for MBTA repair and modernization projects. However, soon after the Governor’s budget was filed the MBTA board proposed to raise $32 million in additional revenues from fare increases to reduce operating deficits — while acknowledging that the fare increases will reduce ridership by 1.3 percent. Under current law the MBTA would receive an anticipated increase of $34.9 million in sales tax transfers — the MBTA’s largest source of revenue — which is slightly more than last year’s growth. The Governor’s proposed changes to sales tax collection in FY 2020 would, if enacted, provide an additional $54 million in mostly one-time increases to the MBTA’s sales tax transfer, bringing the anticipated total transfer to $1.13 billion. The sales tax transfer is the largest source of revenue for the MBTA operating budget, though it has grown more slowly than anticipated since its inception. To read more on the transfer, see How Slow Sales Tax Growth Causes Funding Problems for the MBTA. The Governor proposes $361.9 million to support the Massachusetts Transportation Trust Fund (MTTF), which has also traditionally funded snow and ice control. The MTTF contributes to highways, transit, intercity rail, small airports, the Massachusetts Turnpike, and the Motor Vehicle Registry. The MTTF receives funds from tolls, federal transportation sources, and the state’s Commonwealth Transportation Trust Fund. The Governor’s FY 2020 proposal would provide $32.8 million less than current FY 2019 funding for this account. As part of this proposal, the Governor would create a new Snow and Ice Control fund with $105.0 million. By fully funding anticipated spending for snow and ice upfront, this new account would break with the longstanding practice of annually funding snow and ice control below anticipated amounts with the expectation that lawmakers will provide supplemental funding to the MTTF later in the year for clean-up from winter storms. $1.16 billion as part of Consolidated Long Term Debt Service, an account that pays for several sources of state debt. Payments from the CTF constitute just over half of all such long-term debt service. $209.7 million for debt incurred to finance the largely completed Accelerated Bridge Program and the Rail Enhancement Program. $70.0 million for debt incurred from funding shortfalls for the “Big Dig” — the Central Artery/ Third Harbor Tunnel project. The Governor’s budget anticipates $32.3 million of gaming revenue will be transferred to the CTF, up from $9.0 million in FY 2019. For an illustrated chart and description of funding flows for transportation debt service and operations together (as of 2015), see MassBudget’s fact sheet, What Does Massachusetts Transportation Funding Support and What Are the Revenue Sources? To read about different areas of federal support for state transportation programs in Massachusetts, see MassBudget’s How Vulnerable is Massachusetts Transportation to Federal Spending Cuts? The Governor’s Fiscal Year (FY) 2020 budget includes $2.5 million within the Secretary of State’s office to develop systems to ensure an accurate count in Massachusetts the upcoming 2020 Census. FY 2020 is the important year for Census preparations and this proposal is $1.5 million more than in FY 2019, but still 11.9 percent less than the amount budgeted in FY 2010 — the comparable preparation year for the prior Census. The budget language does not specify how this funding would be used, for example whether it will support the Secretary’s work with municipalities to develop local complete count committees, whether it will be available for distribution to community-based organizations that will be critical for on-the-ground work, or for other important initiatives to ensure a complete count in the upcoming Census. In the Department of Mental Health (DMH), the Governor proposes $221.5 million for hospital facilities and community-based mental health services, which is $13.3 million (6.4 percent) more than current budget levels. Of this, $20,000 accounts for the new minimum wage, which increased from $11 to $12 per hour at the beginning of this year. Many workers who care for children, elders, and people with disabilities do so for low wages at places funded through state contracts. These workers will benefit from the new minimum wage, which will rise to $15 per hour by 2023. Several other DMH accounts also make adjustments based on cost of living. The Governor accompanied his FY 2020 budget proposal with separate legislation providing $75 million in FY 2020 and $137 million in subsequent years for the Global Warming Solutions Trust Fund. The revenue to support this fund would be raised through a proposed increase to the real estate transfer tax — please see the Revenue section of this budget analysis, for a full discussion of this tax proposal. Because the legislation to increase the transfer tax was filed separately from the Governor’s budget, we do not include the $75 million in our funding totals for Environment and Recreation programs. The Executive Office of Energy and Environmental Affairs (EOEEA) will oversee this new trust fund, which was created in the environmental bond bill of 2018. The trust will provide grants or loans to government, quasi-government authorities, and non-profit entities. The funds will help cities and towns with activities such as reducing emissions, developing strategies to adapt to climate change, monitoring or reducing the impact that climate change could have on public health, and funding new strategies or technologies to support carbon emission reduction. The Governor includes $25.1 million for “other post-employment benefits” (“OPEB”) for state retirees, paid from debt reversions or, if those reversions are not available, using Tobacco Settlement funds. However, statute requires that by FY 2020 the state should be transferring 80 percent of the Tobacco Settlement to the State Retiree Benefits Trust (which holds the money for OPEB), or $201.0 million. This means the Governor’s budget is underfunding this liability for retiree benefits by $175.9 million. See table for a summary of revenue proposals in the Governor’s Fiscal Year (FY) 2020 budget. Two of the tax revenue raisers included in the Governor’s budget are ones that already are part of the tax code, but which were added to the code recently enough that no estimate of anticipated revenue from these sources was included in the “Consensus Revenue Estimate,” the baseline tax revenue estimate used by the Administration and the Legislature in crafting their budget proposals. The Governor estimates that taxes associated with the sale of recreational marijuana will deliver $132.5 million in FY 2020, and revenue from the newly adopted short-term room occupancy tax (often referred to as the “Airbnb Tax”) will total $27.5 million. Both sources will deliver ongoing revenue. A third addition of pre-existing revenue not counted already in the Consensus Revenue Estimate is the $50 million in tax-related settlements and judgments that the Governor builds into his FY 2020 revenue total. These are delayed or legally contested, tax-related payments that the Governor anticipates will be resolved in the Commonwealth’s favor in FY 2020. (The FY 2015 budget amended the General Laws to allow much of the revenue derived annually from large tax-related and non-tax-related settlements and judgments to be used for budget appropriations rather than be deposited into the state’s Stabilization Fund, as had been done in years prior. Under the new law, each year, the annual average for these types of collections over the prior five years is calculated and set as a threshold. Collections below the threshold are available for budgetary appropriations, but once total collections exceed the threshold, all additional such revenues are deposited into the Stabilization Fund. Individual settlements that exceed $10 million are designated for deposit into the Stabilization Fund rather than the General Fund.) Though the Commonwealth typically receives over $100 million annually from this source, the amounts can vary significantly from year to year. As these revenues are not included in the Consensus Revenue Estimate, they constitute an increase in the Governor’s bottom line revenue total. A sales tax acceleration proposal, shortening the turnaround time during which businesses may hold onto the sales taxes they collect from customers before they must deliver (“remit”) these revenues to the state. Rather than the current 30-day remittance period, businesses would have only 20 days. This change would pull forward an estimated $306 million in one-time sales tax revenue from FY 2021 into FY 2020. The Governor proposes depositing this revenue into the following special purpose funds: the College Affordability and Success Trust Fund, the Public School Improvement Trust Fund, the School Safety Trust Fund, and the Water Pollution Abatement Revolving Fund. (Read more about these funds in the K-12 section and Education section of this analysis.) A portion of the total would be deposited into the state’s Stabilization Fund. Reforms to online, retail sales tax collection rules. Under the Governor’s proposal, “marketplace facilitators” such as eBay, Amazon, and Etsy would be required to collect and remit sales taxes on behalf of smaller vendors who sell through these sites. This and other associated changes would result in an estimated $41.7 million in additional, ongoing sales tax revenue in FY 2020, taxes that are owed under existing law, but which currently go uncollected. Applying to electronic cigarettes and “vapor products” the same tax and regulatory rules applied to cigars and other tobacco products, thereby generating an estimated $6 million in ongoing revenue in FY 2020. Limiting the amount of funding to be transferred from the state’s consolidated net surplus to the Massachusetts Life Sciences Fund. This limit on the funding available for distribution through the Massachusetts Life Sciences Credit program is expected to save $5 million in FY 2020. This fund supports the cost of a corporate tax credit program that is intended to incentivize companies involved in “life sciences research and development, commercialization and manufacturing” to create and retain full-time permanent jobs within the Commonwealth. Companies must apply for and be awarded these credits, but the state awards credits only to the extent that funds are available. Making an administrative change that would require tax withholding on property sales made by non-resident owners. This would ensure that capital gains taxes due on these sales are collected at time of sale, rather than relying on non-residents (who may have no other reason to file Massachusetts taxes) to file and pay these taxes at year’s end. The Governor anticipates a gain of $4 million in ongoing capital gains revenue in FY 2020 from this source as a result of greater compliance with existing law. Establishing significant civil penalties (up to $50,000) for falsifying electronic records in cash registers and other point-of-sales systems. The Governor expects that clarifying the rules regarding electronic cash registers and establishing stiff penalties for violators will encourage greater compliance with sales tax collection and remittance. The Governor estimates this Sales Tax Integrity initiative will generate $2 million of ongoing revenue in FY 2020. Much of this additional revenue noted above would come from a variety of consumption taxes, which typically are regressive. The tax revenue reductions, by contrast, mostly come from progressive sources — meaning people with higher incomes contribute a larger share of their household incomes toward these taxes than do people with low- and moderate-incomes. Massachusetts already has a regressive “upside down” tax system, one that collects a greater share of household income from low- and moderate-income people than it does from those with high incomes. Given the nature of the additional revenue sources included in the Governor’s budget, it is unlikely they will help flip Massachusetts’ upside-down tax system right-side up. An important exception to the foregoing discussion is the scheduled increase to the state’s Earned Income Tax Credit program, which will begin offering larger tax credits in FY 2020. While the $65.4 million in additional credits will reduce collections from the state personal income tax (a progressive revenue source), nevertheless, the net effect of this tax cut is progressive. The EITC program targets tax benefits to low- and moderate-income working households, enhancing the overall progressivity of the state personal income tax. Every budget relies on a variety of non-tax revenues—federal revenues, which are mostly reimbursements for state spending on Medicaid (MassHealth and related costs); departmental revenues, which are fees, assessments, fines, tuition, and similar receipts; and “transfer” revenues, which include lottery receipts, revenues from the newly-licensed gambling facilities, and funds that the state draws from non-budgeted trusts. $78.0 million in revenues from slot machines, level with FY 2019. This funding is directed to the state’s Gaming Local Aid Fund. $215.5 million from the state’s two resort casinos, an increase of $155.5 million compared to FY 2019, as the Administration expects two casinos to be fully operational during the FY 2020. $35.0 million from the anticipated legalization of casino-based and online sports wagering. In May 2018, the U.S. Supreme Court allowed states to legalize sports betting. The Governor has filed legislation to accompany his budget proposal that would legalize sports betting, but limit it to licensed casinos and certain online entities (such as DraftKings) and limit it to bets on professional sports (explicitly excluding bets on college or high school sports). $29.5 million from sale of the East Cambridge Court House. This one-time revenue was initially anticipated for the FY 2019 budget, but the sale has been moved to FY 2020. $12.0 million in licensing fees from the continued expansion of the retail recreational marijuana industry, $6.0 million more than the amount expected for FY 2019. $85.9 million less in federal reimbursement for the Children’s Health Insurance Program (CHIP) in FY 2020 compared to FY 2019, in part because an enhanced reimbursement rate (88 percent) for that program drops back to 65 percent. One of the provisions of the federal Affordable Care Act was that the federal reimbursement rate for CHIP would increase by 23 percentage points until September 30, 2019, but after that the reimbursement rate drops back to its previous level. In his FY 2020 budget, the Governor proposes depositing almost $300 million into the state’s Stabilization Fund (often referred to as the “Rainy Day Fund”). This total includes revenue accounted for in the Consensus Revenue Estimate as well as dollars from additional revenue sources presented or proposed in the Governor’s FY 2020 budget and related legislation. If the FY 2019 deposit also occurs as the Governor anticipates, this would bring the fund total to just under $2.8 billion at the close of FY 2020. This deposit is an important step toward preparing for the next recession. With very strong capital gains tax collections in FY 2018 and likely again in FY 2019, the Stabilization Fund has grown significantly in the last two years. If deposits are made as expected, by the end of FY 2020, the fund will have more than doubled since the close of FY 2017 (growing from $1.3 billion to almost $2.8 billion). FY 2020 Governor is the Governor’s proposal. FY 2019 Current is the budgeted FY 2019 General Appropriation Act (GAA) enacted in July 2018 as amended by supplemental budget legislation. All totals include MassBudget adjustments to the state’s published numbers as described below. MassBudget’s budget totals include the “pre-budget transfers” of funds. There are statutes requiring automatic appropriations of revenue to support certain functions independent of the annual budget. In FY 2020, these transfers add $5.23 billion to the total. These transfers include: tax revenues dedicated to the Massachusetts Bay Transit Authority (MBTA) and school building assistance, cigarette excises dedicated to the Commonwealth Care Trust Fund, state contributions to the pension system, transfers to the State Retiree Benefits Trust, transfers to the Workforce Training Trust, as well as others. Although these transfers function no differently from other appropriations, the Governor and Legislature do not reflect these expenditures in their budget totals; instead, they are shown as amounts deducted or transferred from revenue prior to the budgeting process.